Our home shredding service provides you with a great value solution for disposing of your confidential documents in a hassle free manner. When preparing to move, de-clutter or generally thin your paperwork, you will probably come across documents that you need to dispose of that are likely to contain sensitive information that could cause problems if they ended up in the wrong hands. All of the above could be used for identity theft, being used to open credit cards in your name, for example, leaving you to pay the bill. Worst still, your stolen identity can be used for conducting a wide range of illegal activities, possibly resulting in police involvement. If you keep documents with such personal information because you wanted to safeguard your information and you now find yourself in a position where you want to dispose of any, or all, obsolete documentation and make more room in your file, cabinets, home or office, then our shredding service is for you. It’s really easy, just give us a call on 01249 818951 and we’ll post out a shredding bag and security tag the same day. Just fill the bag with up to 16KG of paper to be shredded, place the numbered security seal at the top of the bag and return it to Calne Shredding Services, 7 Harris Road, Calne SN11 9PT or just give it to the crew on your removal day. Peace of mind from just £5.00 when you bring your shredding to Calne for shredding, or just £6.00 when you ask for the bag to be mailed to you. 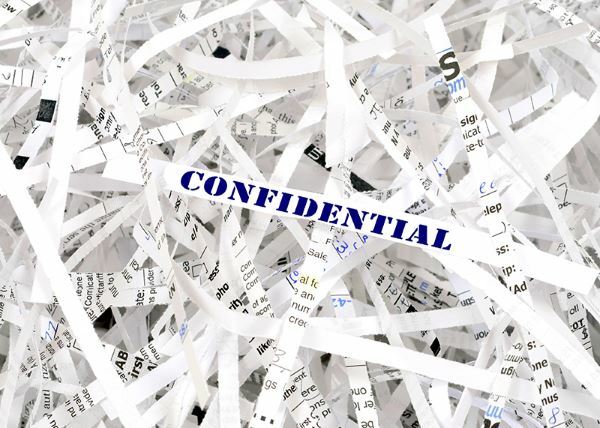 All our staff involved with the secure/confidential shredding have signed a non-disclosure agreement ensuring your documents are handled discreetly and securely throughout the collection and destruction process. Destruction is undertaken in a dedicated, secure warehouse where paper is baled and sent to a local mill for recycling, thus helping customers to be security conscious and environmentally considerate at the same time. A signed Certificate will be issued as soon as the destruction has taken place.